to maintain as true and correct; to uphold honor. 10,000 YEARS AGO A STRANGE ALIEN VISITED OUR PLANET AND CREATED A RACE OF SUPERHUMANS. THEY WALKED THE EARTH LIKE GODS UNTIL THEY GREW TOO POWERFUL, AND THEIR MYSTERIOUS CREATOR STRUCK THEM DOWN. NOW EARTH FACES THE ULTIMATE THREAT FROM BEYOND THE STARS, OUR ONLY CHANCE FOR SURVIVAL IS THAT MYSTERIOUS ALIEN AND THE DESCENDENTS OF THOSE SUPERMEN HE CREATED..... VECTOR, ZEPHER, SHATTER, PREYLORD AND NOX.... THE VINDICATORS. Welcome to Rodcom1000.com, Home of the Original Vindicators Earth’s most powerful comic book super heroes. New We will be at New York Comic Con from October 10th to the 13th with new issues of the Original Vindicators numbers 1 and 2. We will also have lots of goodies and free give aways. Click here to see where we will be. New Check out the Vindicators Animated Intro Here! Want a copy of the Original Vindicators #0 of your own? Now you can get your own copy of the Original Vindicators #0 for $4.00 and many other goodies HERE. Copies of the Original Vindicators Art Book are available for $15.00 directly from Rodcom1000.com. Email your request to RODCOM1000@AOL.COM. New Check out the PowerHouse Hero Group Here! We have a new Heroes and Rivals character pages with some amzing new art and characters.Check it out! Original Vindicators Trading cards! That's right, the OV have their own trading card and you can have them too! Check it out! Deviant Art slide show! 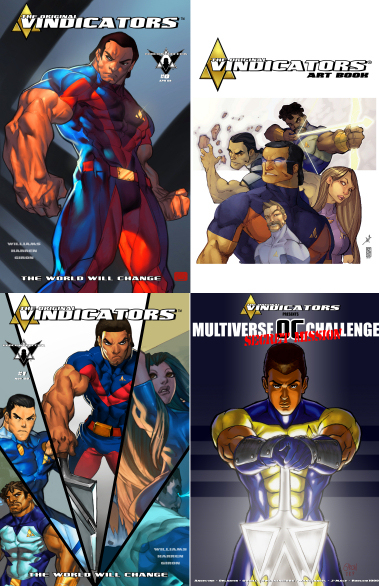 Check out all, new all cool Original Vindicator art in the new slide show feature! Check that out below! The UVC Urban Voice of Comics Interview with Rodcom1000 is out! Get your copy today! I WANNA HEAR FROM YOU! Write, ask questions, make art contributions or just say hello.